Comprising four features and one short film, the Views From Long Island section focuses on local filmmakers, the area’s unique landscapes, and the important social and political issues facing Long Island communities. Supported by the Suffolk County Film Commission. One $3,000 Suffolk County Next Exposure Grant will be awarded to a film in the Views From Long Island section. This program supports the completion of high quality, original director-driven, low budget independent films from both emerging and established filmmakers who have completed 50% of principal photography within Suffolk County, New York. Director Marc Levin (SCHMATTA: RAGS TO RICHES TO RAGS, HIFF ‘09 and HARD TIMES: LOST ON LONG ISLAND, Audience Award HIFF ‘11) presents CLASS DIVIDE, a look into the modern effects of gentrification in West Chelsea, New York, seen through the eyes of students from both sides of the street—one avenue and worlds apart. On one side of the intersection of 10th Avenue and 26th Street sits Avenues, a world-class private school with a $50,000 per year price tag; on the other side sits the Elliott-Chelsea public housing projects, home to thousands of low-income and underemployed residents. In the face of rising inequality, stagnant class mobility, gentrification and much more, the kids from both sides of the street grapple with their relationship to each other amid the stark transformation..
At the end of World War II, Harry deLeyer journeyed to Long Island, New York, where he made a name for himself as a horse trainer and riding instructor at the exclusive Knox School. His career took a new turn when he paid $80 for an Amish plow horse named Snowman, bound for the glue factory. 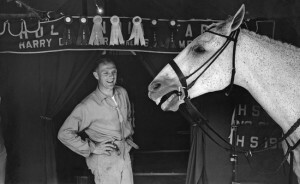 With the odds against them, Harry and Snowman went on to break show jumping records, becoming household names in the late 1950’s after winning the sport’s Triple Crown. The award-winning documentary HARRY & SNOWMAN is a touching tale of a unique, decade-long friendship, told first-hand by Harry, now 85. Finding a date, getting dressed up, and going to a school dance can be difficult for any teenager. For many living with autism, the idea of going to a spring formal is even more intimidating (and even frightening), considering the need to navigate social cues they don’t understand. Alexandra Shiva’s HOW TO DANCE IN OHIO follows a group of young people as they attempt to overcome their fears and prepare mentally, emotionally, and physically for this rite of passage. With a gentle and sensitive eye, Shiva follows the group through counseling and a series of role-play exercises leading up to the big dance. 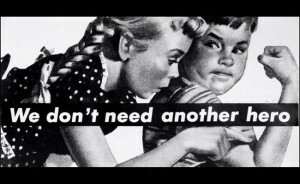 Narrated by the legendary artist herself, this brief portrait of Barbara Kruger raises many questions about art and the artist. Hilary Knight reflects on his life as an illustrator and his relationship to his most successful work: Eloise, the precocious six-year-old who lives in New York’s Plaza Hotel.